A moist turkey will make your day—this recipe won't let you down. Remove giblets and neck from interior cavity of turkey; reserve for gravy stock. Rinse bird; pat dry. Cut off wing tips; reserve for gravy stock. Season cavity with salt and pepper. For Herb-Butter Seasoning, combine butter, the fresh herbs, and garlic. Starting at the neck end of the turkey, loosen the skin by sliding your fingers underneath it, being careful not to tear it. Slide your hand as far as you can toward the other end of the turkey, separating the skin from the meat. Rub about two-thirds of the herb-butter seasoning over the entire breast. Spoon some of the Pear-Pecan Stuffing into the neck cavity. Skewer neck skin to back. Spoon more of the stuffing loosely into the body cavity. (If you pack stuffing too tightly, it will not get hot enough by the time the turkey is cooked.) Tuck drumsticks under tail skin, or tie to tail. Place turkey, breast side up, on a rack in a shallow roasting pan. Insert a meat thermometer into the center of one of the inside thigh muscles. The bulb should not touch the bone. Rub remaining herb-butter seasoning over the entire turkey. Cover turkey loosely with foil. Roast in the preheated oven for 20 minutes. Reduce temperature to 350°F (175°C). 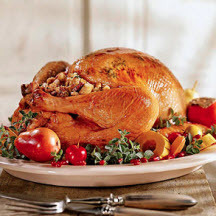 Continue roasting turkey for about 31/2 to 4 hours or until thermometer registers 180°F (85°C). Cut band of skin between legs after 2 1/2 hours so the thighs will cook evenly. Bake casserole of stuffing alongside turkey during the last 40 minutes or roasting. During the last 30 minutes of roasting, uncover turkey. When done, remove turkey from oven; cover. Let turkey stand 20 minutes before carving. To serve, remove stuffing from turkey; transfer to a serving bowl. Carve turkey and serve warm.